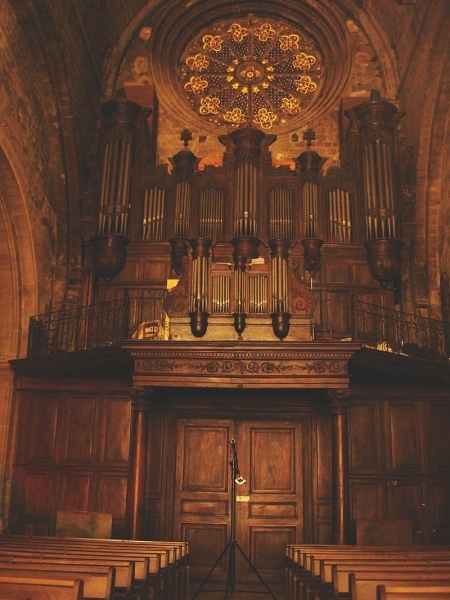 Description: The history of the organ in the church of Forcalquier is very turbulent and only a part of the material remained from the baroque period, from the original organ. Most of it comes from a 19th and 20th century restorations. The cathedral in a small and picturesque French city called Forcalquier had a small organ with 9 stops built by Pierre Marchand in 1627. It is said that during the time of the Revolution, the church and the organ served for the embellishments of the feasts of the new regime. In 1803, the Christian worship was restored in the church. Half a century later, Prosper Antoine Moitessier rebuilt the organ completely, reusing also the ancient material. The Grand orgue had now 22 stops, a Récit expressif (enclosed in a swell-box) and Pedal with 4 stops. The organbuilders Cavaillé-Coll – Mutin made further reconstruction in 1932. They extended the pedal board range and changed the action to the pneumatic one. Recently, the organ was carefully restored and enlarged in two steps in 1981 and 2000 by Alain Sals. The action was changed back to the mechanical one, new Positif de dos was installed using the remaining old pipes, some new stops were added, so that now the organ has 36 speaking stops. The swell-box of the Récit was most probably removed during this restoration. The composition and the timbre of the organ is typically French, although rather sharp, "chiffy", with a strong feeling of „inégalité“, i. e. there are numerous voicing breaks where suddenly the timbre of the stop changes. The most prominent one is the division of the Voix humaine of the Récit, which is in fact composed of two different stops, one for the Bass part and the other for the Treble part of the keyboard compass. The specification given below gives also the idea how old every stop is, so, whether it comes from Marchand (1627), Moitessier (1847) or Cavaillé-Coll-Mutin (1932) or Sals (2000).